From the beginning of the feature several years ago, Misericordia University wanted to set a standard for the “Outstanding Athlete” feature. As a full page feature article that would remain in each edition for years to come, the imagery had to be unique, repeatable and eye catching. We established a concept of dramatic lighting and confident poses that would rival national sports campaign marketing. 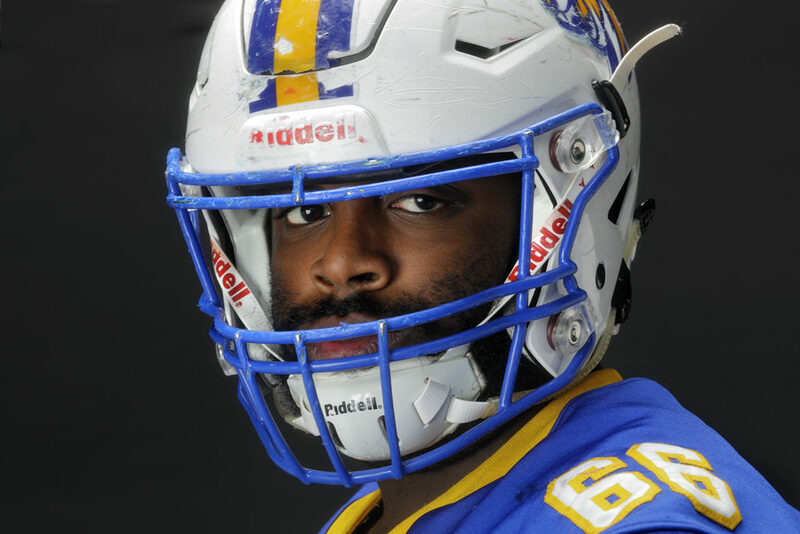 In this portrait taken of a Misericordia Football player, using a close up captures the unbreakable focus and level of seriousness on the subject’s face which sets the mood of the photo. The bright colors on the uniform in the foreground placed against the black shadowed background helps bring out the intensity of the subject. We have managed to retain the overall style while still adapting for different sports including soccer, lacrosse, football, basketball, baseball and even swimming.